Ha Ha, reading to them may be better in the long run but no points for Mummy in the short term. How about checking the kids costumes on ebay which can be many and varied without being expensive. You could create a wardrobe of dressing up clothes since this is also good for their imagination. Or maybe you have a service you could swap with another Mum who has sewing skills? If you buy some old material and they make it up. One old favourite from my daughter’s dressing up days was the headless woman. using an old dress of yours which goes above her head, just add padding and a bloody neck ( a polystyrene jewellery stand from ebay) and then either a well painted of papier mache balloon under the arm. Frankenstein for boys should be easy with a too big jacket of Dad’s, some green eye shadow and neck bolts applied to an alice band he can wear round his neck? Have fun. But, I’m going to pass on your idea of a headless woman (or man) to my daughter-in-law (who loves dressing her three little boy monsters on Halloween). That is a brilliant costume! Actually, same with the Frankenstein. Jeez, wish I’d known you 20 years ago!!! Once again you strike a cord…my Mom the night before Halloween would ask me “what are you going to be for trick or treating”? She wanted nothing to do with the costume. She sewed beautifully, as you know, and was happy to go thru my candy and pick out her favorites when I got home, but I was on my own thinking up a disguise. Several years I filched a white pillowcase out of the linen closet and cut out 2 eyes, a bum was a popular choice since I borrowed a flannel shirt and old hat from Dad then just dirtied my face, one year my grandma gave me her old bathing suit – a sailor dress of navy blue wool – I almost died from being so hot, I can’t believe she ever wore it in the summertime and she would have sunk if it got wet! So, then I get my own kids. Starting with what seemed like the first day of school, they would suggest a million ideas for Halloween costumes. Thank goodness our daughter started ballet young and she was happy wearing her recital outfit from the spring! But, our son….we cut eyes out of white pillowcases, borrowed Dad’s flannel shirt, put a baseball cap on and dirtied his face – another generation of ghosts and bums! We lived on a small street out in the boonies, so those dozen houses were the only places they trick or treated and they were happy. I love fall! It is my favorite season! Pumpkins, gourds, Indian corn,cornstalks, apple cider – wonderful! Halloween, no thanks. But, I forgot about the Best Halloween Ever! Last year. The lake always has a Halloween Parade for kids and grandkids, followed by a picnic of hot dogs, cider and s’mores. We are usually at Capon and miss it, but last year we had our then 3 yr old granddaughter up for that weekend and her clever Mom had made an enchanting Tinkerbell costume. She waved her wand and had a wonderful time. After the picnic, she asked if she could go see Nana. Nana was in a rehab facility recovering from an intestinal blockage. But, I loved that she wanted to show Nana (her great grandmother) herself all dressed up, so off we went. The smiles on all the residents as she skipped down the hall saying “hi! I’m Tinkerbell ” made it a very special Halloween indeed. 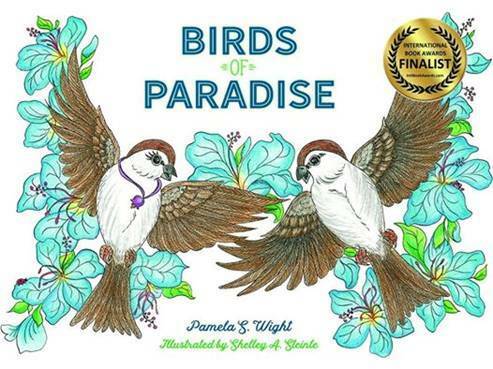 Thanks, Pam, for reminding me…now I’m going to go have a little happy/sad memory cry…..
Oh Carla, you have me laughing and crying at the same time. First, you had to have been the most adorable bum in the little town of Pitman. You would have been a perfect gypsy too – same concept. And yes, I like your ballet recital Halloween costume for your little girl – mine wore her leotard one year with pink frilly tutu, pink ballet slippers and a crown and a baton – that was a favorite of both of us, I believe. But your granddaughter’s skipping trip down the halls of the rehab facility – beautifully tearfully triumphantly spectacular. YES!!! We never had money–to do the costumes, even if I had wanted or been crafty enough to do. Most of the candies, with numerous allergies and migraines, were a definate NO anyway. I think that some of my best thinks about costumes, the ones that won the kiddos cuddos at least, came from wearing ‘normal’ clothes but speaking with signs or actions. One year, I let them go out in footed jammies, after dinner (how smart THAT, no fighting and changing later!) and an empty pillow case. I covered the pizza pan with foil and hung it round my neck with string. We were Winken, Blinken, and Nod–by the light of the silvery moon. Another year, I put them into their gym uniforms, slapped Christmas deer antlers with ribbons and bells onto the girls’ heads wrapped some strands of yarn, handed these to my son who wore an elf hat, and gave him a sign that said Reindeer Trainer. They thought that one was soooo STUPID–they won money baby! My eldest E, made me read to her-and an entire gathering of other dorm residents, the Teeny Tiny Ghost, every darn year for three days in a row. (rolls eyes). They all chipped in and got a copy so they could see the pictures while I read it with the voices. Stories are FUN! Well, actually, I’d say you were SMARTLY crafty. Maybe not arts and crafts, but those are intelligent, clever, wonderful Halloween outfits!!! Oh my, I wish I knew how to come up with ideas like these. Winken Blinken and Nod – FABULOUS. 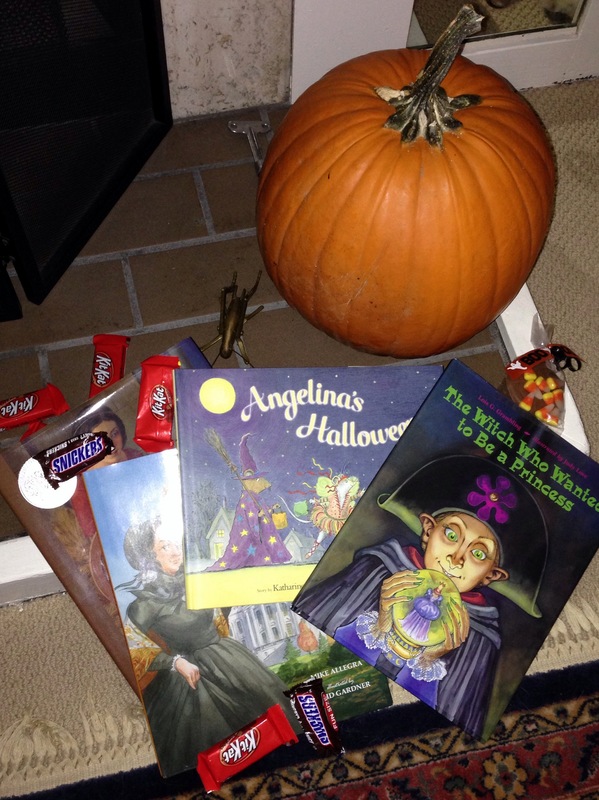 Now, I want to find the book Teeny Tiny Ghosts – I have little grandchildren to start reading Halloween books to! You’re the best – THANKS! Ordering today. As a kid I was lucky enough to have killer costumes; my grandmother was a seamstress and she loved to create something cool for me. But, costumes aside, I always hated Halloween. I felt weird going house to house begging for tiny “fun size” pieces of candy that I might not even like. I felt like I was doing a lot of work for very little benefit. And that work involved being put on display for strangers, which weirded my out a little. So I went into early retirement and segued into the handing-out-candy role without any regrets. Velllllly interesting (as a cartoon vampire once said, right?). You were a philosopher and “interpreter of life” and old soul even when you were young. I’m not surprised one bit. Yes, a too-wise little boy should ponder the necessity of entertaining the old farts at home just for a tiny piece of candy. I like your attitude, and wish I’d inspired a little of that in my own kids. They, unfortunately, wanted the costumes and the bags of loot. If it makes you feel any better, I couldn’t inspire those feelings in my own boy, either. He is awaiting the big day with bated breath. Tell your kids they’ve got it lucky. All we had were nasty pieces of sheet plastic with the costume printed on it and a crap plastic mask. Now costumes are sweet! I’m still feeling envious for my kid self. That is so true – I could definitely tell my kids ‘you got lucky, the costume could be plasticky junk.’ Yes, kids have it MUCH better these days than we did. Man…I TOO hate(d) Halloween! I despise it! I want it to DISAPPEAR! Thank goodness the kids are gone and we’ve been ousted by our friends who love(d) Halloween. Life is too short to try to pretend. There you go – I like the DITCH HALLOWEEN attitude. Also, there must be quite some story about the friends who ousted you. Well, they had a problem anyway, if they loved Halloween. Funny, as a child I hardly noticed Hallowe’en and, as a parent, our kids weren’t bothered one bit. It’s a bit of a non-event here really. I believe its origins were from the feast of Samhain in Pagan Ireland and the festivities were brought to America by the Irish emigrants. Good point. 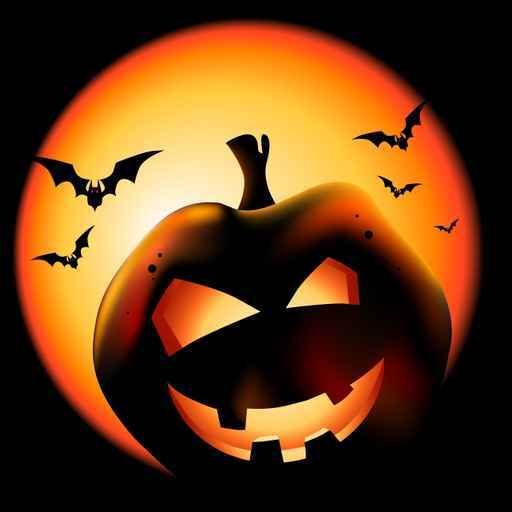 In the U.S., Halloween has become a bigger and bigger event every year. I can’t figure out why. The newspapers give statistics about how much money people spend each year on Halloween – costumes, candy, decorations – and the line on the chart goes up up up. I don’t get it. Pam, if you’re looking for a sweet Halloween book, my kids – at home and in the classroom – loved The Biggest Pumpkin Ever by Stephen Kroll. Linz just ordered it for Celia and Gwenny from Amazon and they are enjoying it, too! Okay, great! I shall add it to my library. THANKS. Pam, your post really resonated with me as my daughter’s BIRTHDAY is ON Halloween. Imagine the pressure! One year (and one year only) I gathered up enough courage to make her a Unicorn costume. It was pretty cool, I must admit. She loved it. I decided since I couldn’t top the Unicorn in the future store-bought costumes would do. BTW, she loved those, too :-). You’ve beaten me on the ‘tough Halloween choices’ with a birthday on top of the same day. Ouch. You get gold star mother award for making her a most beautiful unicorn costume, and gold star plus for realizing you should never try to outdo yourself on another Halloween! I was a gypsy one year! A politically-incorrect Indian princess another year, loads of other things I can’t remember. I don’t think I was very creative as a mom, and as a grandmother, I don’t have to worry about it – it’s someone else’s job now! Mostly my grands are happy with store-bought. Yes, costumes are different now that we worry more about the p.c. element. 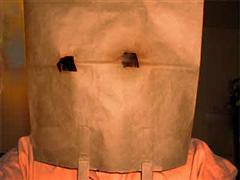 My son may have had it right with the paper bag and holes! That was really funny. 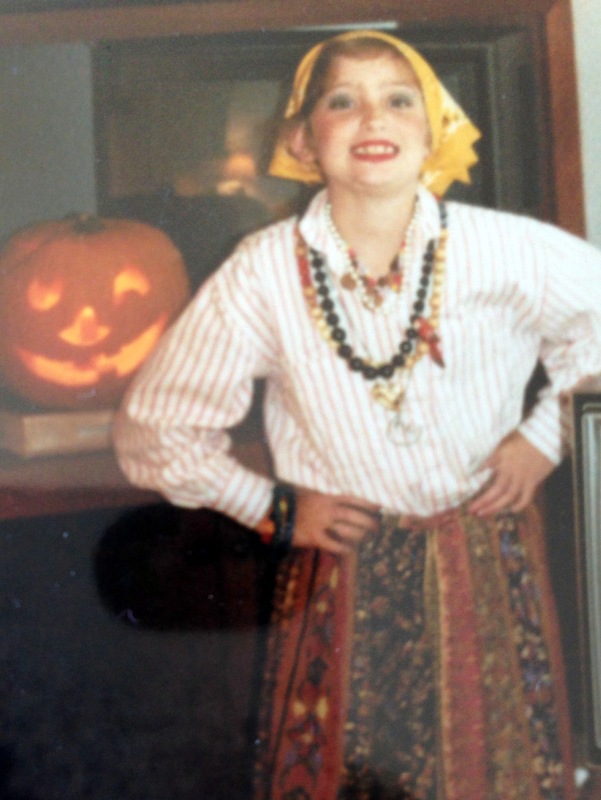 I was totally raised by a Mom who lacked creativity (or energy, with 5 kids) in the Halloween area and I am pretty sure I had a string of years in which I dressed as a gypsy as well. Then I moved on to being a hippy. All courtesy of the parental wardrobe. Yes, I admit, gypsy/hippy outfits go hand in hand. Hopefully you’re not Halloween-phobic because of the, shall we say, convenient costumes. Thank you for still liking me, and my writing, even though I failed as a costumey parent. You are my hero(ine). Truly, if you had lived nearby when my kids were in the trick-or-treat stage, I would have come to your doorstep with hands in prayer arrangement, asking for Halloween help. By the way, you have delightfully made my day. THANKS. I am grinning ear to ear (like a pumpkin), thinking of you laughing. Cheery cheers! Ha Ha! Very fun to read. And I can relate. I never much went for Halloween as a kid, so was probably not all that adept at it as a parent, myself. We loved Halloween! And I loved making costumes…never very crafty and usually out of cardboard boxes – everything from robots, to TV sets, to a box of popcorn. I miss those days! Ha, yes! I’ve often aspired to be an arty crafty kind of parent, not just at halloween, any time, but it’s never worked out well. Halloween has generally consisted of just going to the store and buying a complete costume, but this year funds aren’t allowing for that, I tried the “Now that you guys are 11 and 14, you don’t actually still want to dress up for halloween do you?” approach, but apparently they do. So for my son, we’re putting cuts and slashes into an old white t-shirt and trousers, and then putting some red paint dragged bloodied handprints on them, and splatters (that’ll work right?). My daughter is making her own catwoman type thing which I’m sure will be good and much better than anything I could make! So, yes, exactly that’s the way it ended for me. My daughter became artsy crafts Martha Stewartyx10. Ack! She has three little ones 4 and under and guess how creatively they’re dressed up for Halloween? It’s downright scarily spooky. My son calls wearing dress shoes, ‘dressing up for Halloween,’ so a paper bag would now be too much for him. My take? Whatever our kids are at 10, they’ll be that, but even more, as adults. So funny. This was exactly like my mom and me. She was not creative at all, but I got all the Martha Steward genes. It didn’t matter though. It was all about the candy anyway.